The Dictionary Project was founded in 1995 by Mary French of Charleston, SC. It’s primary focus is to promote literacy to children in third-grade as they transition from learning how to read, identify, and use information. Over the course of the program nearly 15 million third-grade students have received dictionaries. 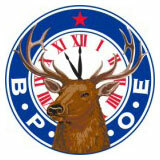 Elks joined this movement in 2004. Nationwide they have donated more than 1.2 million dictionaries to third-grade students and their teachers as sponsors of The Dictionary Project over the last 6 years. There are 600 lodges that actively participate in the program. To see if your nearest lodge participates in this program, find a lodge near you.